In his new book, Assistant Professor of Marketing Adam Alter explores how our environment shapes what we think, how we feel and the ways in which we behave. Each chapter describes how a different feature in the environment affects us – beginning with the names that our parents gave us at birth and the names we in turn give to our children, companies and hurricanes, and ending with the weather patterns that affect us all. 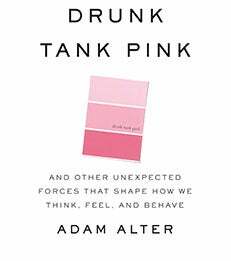 Drunk Tank Pink covers a number of facts, anecdotes and experiments that collectively explain how the most unexpected factors lead us to think, feel and behave the way we do.